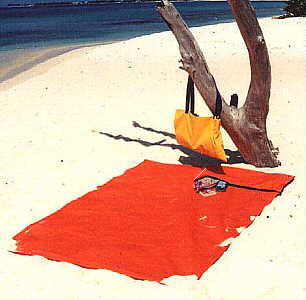 THE BEACHTHING is a beach blanket that is contained in an attached beach bag. As a beach bag, its generous size will hold just about anything you need for your beach blast. An extra zippered pocket is sewn in to hold smaller items. It's the perfect beach accessory for beach fans! Place THE BEACHTHING on the ground, roll out the attached beach blanket, and stuff the bag with clothing or beach towels and personal items to form a comfy pillow. No clutter on your blanket and no valuables left out in the open! THE BEACHTHING is large enough for two adults! Having a picnic? THE BEACHTHING makes the perfect ground cover. Huge at 58"x84" and made of a 50/50 poly/cotton duck. Beach sand shakes off easily! (Great for sandy or pebble beaches.) Machine washable. The BeachThing is Not Terrycloth material!